looks fab, stance, colour, everything! good work! yea it does sit forwards. i was thinking about cutting out a massive hole in the front for it but when i realised it the cut out would overlap the inner wings i thought better of it and just plonked it on the front 'as is' and to be honest it doesnt actually notice that much when you look at it. im well happy with the mk1 look of it now. i think it does give a nice meaningful look lol. hopefully at the weekend i'll get the passenger seat bolted in as well as fitting the new radiator fan, dash rails, boot pins, and throttle cable. next weel should see the battery and petrol tank fixed down so they dont move about while driving. well are you coming to the L2B ? its going to be in the show n shine. Edited by minidan, 15 April 2010 - 08:19 PM. yea just buy the surround, it works pretty well really, its not a huge gap between the grille and body. noone would really notice unless you pointed it out. anyway! been working like crazy again all weekend doinf lots of fiddly jobs and bit of tweeking here and there. not many photos to show (sorry) but here are a few of the most interesting bits! of the minus dash rails that was impossible so i had make the middle bit sit forward and it gave my the oppertunity to angle it upwards slightly so i can see the gauges better. of course grey isnt the final finish but it was the only paint i had at the time. im thinking of covering it all in stainless steel once i get the car on the road. also gained enough room for the cone filter but swapping the standard sandwich plate for a thin one that has a take off for a vacuum gauge which i plan to fit in the future. also gave Jason a much need wash! 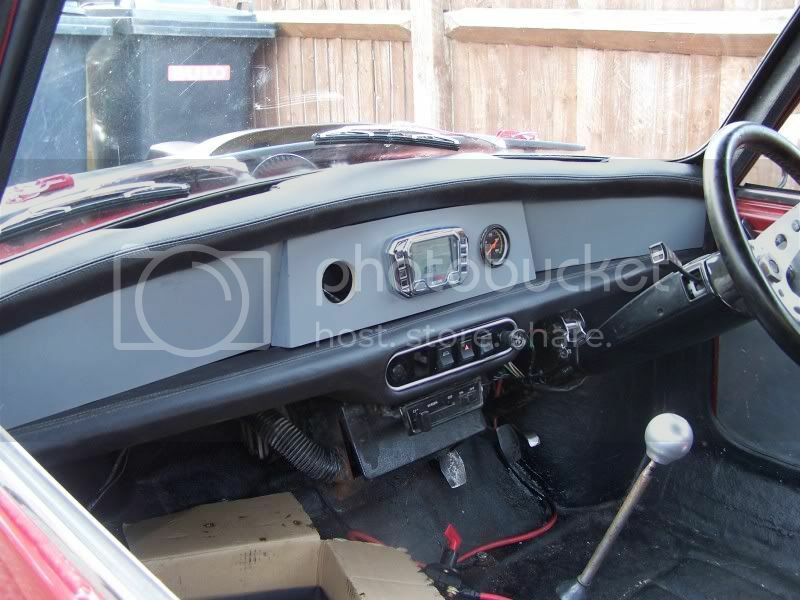 Great work, dash looks great good choice of instruments also cus of the small distance between the dash rails, like it alot better now it has proper dash rail pads. 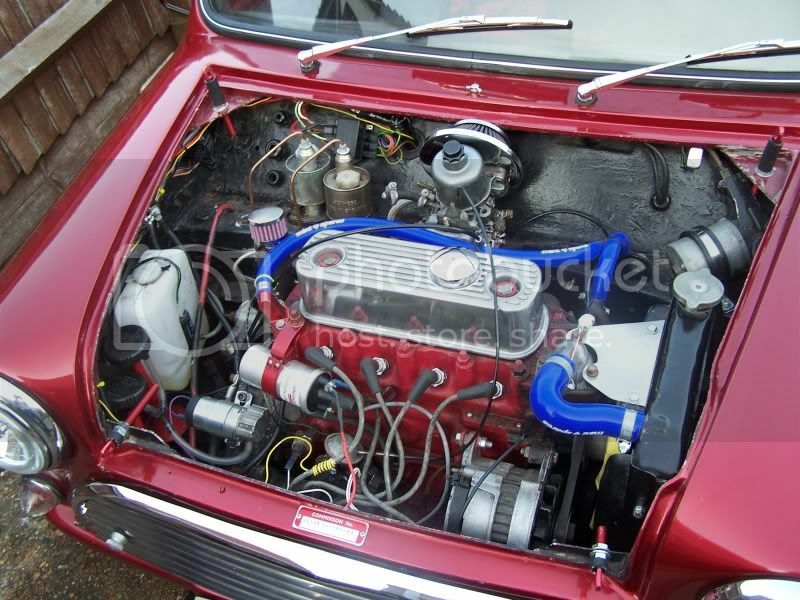 Engine looks well tidy. Keep up the good work and keep the updates coming. yea the dash rails are nice. ok they arn't a fancy one off custom show winner type thing, but they suit minis. and i like em. Did you see that minus shell on ebay that ended the other day, would have considered buyng it but it had a removeable front and im not a fan of them. yea i did. i do prefer the solid fronts. Ye think it went for £1275 or something like that. I though it was quite cheap. i would have liked that custom rollcage he had with it!! Ye, saw that, the whole lot was for sale on TMF classifides. The cage looked mint but preferably when i get a minus shell im wanting back seats. but there is a much more serious problem than that right now. the clutch slips like crazy! arrrrrrrrrrrrrggggggggg! so i suppose i will have to try and fit a new clutch. 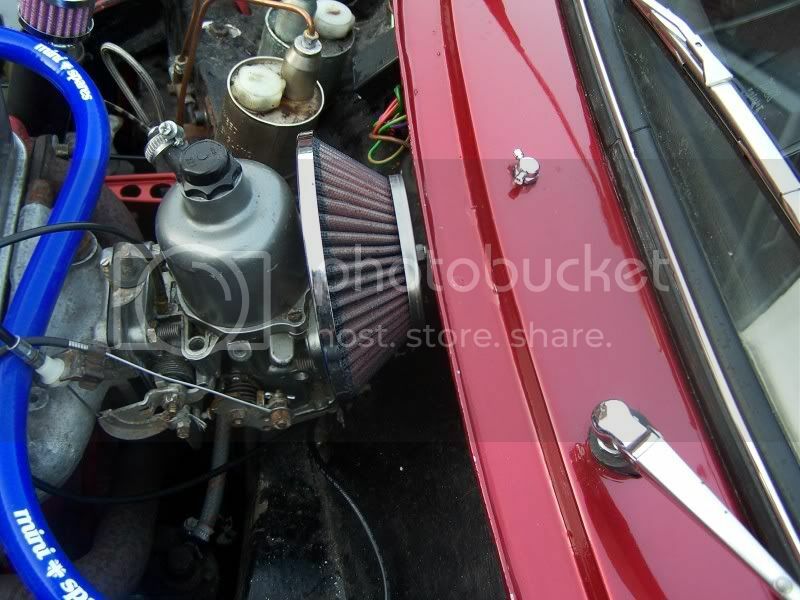 how hard is this with the engine in place? that minus shell did go pretty cheap... although saying that it wasnt far off what i paid for mine, and i got a complete car!!! i have rasied up the front and now its a lovely and bouncey still have to raise the rear as that crashes into the arches very hard on bumps. today i are be mostly replacing the clutch. after first driving him i knew it was slipping, and assumed it was just worn out. when i got the clutch cover off, the inside of it was covered in oil so i feared the worst. that the oil seal was leaking and the clutch wasnt worn out but just covered in oil. after a few hours of trying to get the flywheel off, then rotating the puller and trying again, it popped off. took it apart and it wasnt covered in oil . yeay! just really worn out. the pressure plate was practically worn down to nothing lol. also bolted the passenger seat in today. and fixed the fuel tank in properly. just got the raise the rear suspension a bit to stop it bashing the bodywork on bumps then its mot time! will try to get the mot this week.